Bayside Expo sign: Workers were seen inspecting the structure on Mt. Vernon Street on Wednesday morning. Reporter photo by Bill ForryCompany says 100 foot sign tower should be taken down "immediately"
A key Columbia Point property owner is pushing back strongly against the University of Massachusetts Building Authority’s plan to immediately demolish the empty Bayside Expo Center — now owned by UMass. Corcoran Jennison Companies is also raising new safety concerns about a landmark sign tower on Mt. Vernon Street that once promoted the exposition center. In a letter sent to state building inspectors on March 4, an attorney for Corcoran Jennison called for a meeting between the parties before the demolition of the Bayside Expo structure is allowed to proceed. The letter states that the company does “not oppose demolition”, but adds that it is “very concerned that, if not properly managed and coordinated, this work could compromise the structural integrity of the Bayside Office Center,” the company’s five-story office building at 150 Mt. Vernon Street that is adjacent to the Expo building. The office complex currently houses offices for Corcoran Jennison, SEIU 1999, UMass Boston classrooms and offices and the state's Registry of Vital Statistics. The Dorchester Reporter, which leases space from the Corcoran Jennison Companies, is a longtime tenant in the building as well. UMass Boston purchased the sprawling Bayside site in 2007 after Corcoran Jennison Companies lost the building and its expansive parking lots to foreclosure. Corcoran Jennison maintained ownership of the office center and the nearby Doubletree Hotel on Mt. Vernon Street, along with many other holdings on the peninsula, including the 1,284-unit Harbor Point Apartment complex. The two parties have for some time been embroiled in a standoff  over land use, easements, and the future of the Bayside section of Columbia Point that they share that has led to long delays to BRA-approved building projects and raised difficult questions about the long-term prospects of successfully redeveloping the area near the gateway to the peninsula. The university has indicated that it intends to build out the Bayside site for academic and residential use, but in the near term it intends to utilize the site primarily for parking. Patricia Filippone, the executive director of the UMass Building Authority, indicated in a statement that plans for the demolition of Bayside would proceed. Work will take approximately 2-3 months and begin "as soon as all required approvals are received." In the March 4 letter, which was addressed to state building inspectors Andrew Majuri and John C. Wojciechowicz, Corcoran Jennison’s chief counsel, John Mostyn, also sounded an alarm about what he deemed “an imminent threat” from a defunct digital sign that was once owned by Corcoran Jennison, but is now controlled by UMass. The 100- foot-tall sign once featured messages about upcoming expo events and other notices, but has been out of use for years. In his letter, Mostyn alleges that the sign has been “neglected” by UMass and “poses a far greater and more immediate threat of harm” than the Bayside building itself. UMass Building Authority director Patricia Filippone told the Reporter in a statement that the sign was inspected "at the request of the Department of Public Safety" even though "UMBA does not believe the sign is structurally deficient." 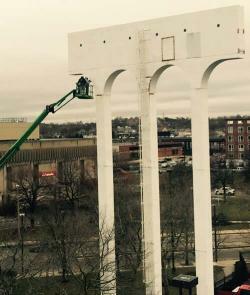 The flashpoint over the sign tower and the demolition of the expo building is just the latest in a series of disputes between the university and Corcoran Jennison Companies, owned by father-and-son team Joe and Michael Corcoran. Both sides have grown increasingly frustrated as negotiations on parking rights, utility easements, and associated costs have disrupted plans for the two parties. In an interview last week, Michael Corcoran, the company’s president, told the Reporter that the stalemate has reached a new point: Corcoran claims that Filippone, the director of the UMass Building Authority, has asked Corcoran if he would be willing to sell the company’s Columbia Point real estate holdings to the university. The Reporter asked Filippone to address that claim. In a statement, she said: “The UMass Building Authority's No. 1 objective is to assist the campuses in providing first-rate facilities and infrastructure for the university's 73,000 students. At UMass Boston, that includes the ownership and management of the former Bayside Exposition Center property, which is critical to meeting the current parking needs of the 17,000 students who commute to the campus, and future academic needs,” Filippone said. Corcoran said that his company has no interest in selling its holdings to UMass — or any other entity. He says his chief goal is to complete plans to build a new residential complex, University Place, and expand the Doubletree Hotel. Both projects have won approval from the Boston Redevelopment Authority, but Corcoran says he is unable to move forward without securing easements and other agreements with UMass. Corcoran acknowledged this week that UMass officials have met with his attorney to discuss the expo center demolition but that technical issues about the razing remain unresolved. According to Filippone, representatives from the UMass Building Authority and their engineers met with Corcoran Jennison's personnel on March 10 "to review and discuss the demolition plans." "Counsel for both parties have had multiple conversations," Filippone said.